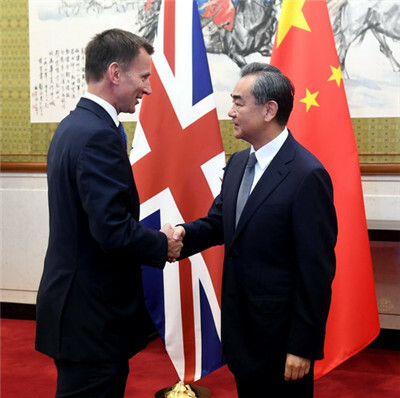 On July 30, 2018, State Councilor and Foreign Minister Wang Yi held the 9th China-United Kingdom (UK) Strategic Dialogue with Secretary of State for Foreign and Commonwealth Affairs Jeremy Hunt of the UK in Beijing. Wang Yi expressed that China-UK relations have always maintained a stable development momentum in recent years. 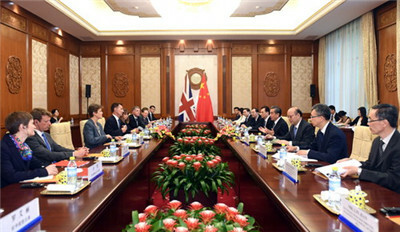 Both sides should implement the important consensus reached by the leaders of the two countries on the "Golden Era" of China-UK relations, constantly consolidate and improve strategic mutual trust, increase strategic consensus, strengthen strategic cooperation, and respect each other's core interests and major concerns, so as to build a model for the new type of major-country relations. This year marks the 40th anniversary of China's reform and opening up. The Chinese side has announced and already been implementing a series of important measures to expand opening up, which will provide more opportunities for both sides to carry out mutually beneficial cooperation. The UK side is welcome to participate with greater ambition in international cooperation under the Belt and Road Initiative, conduct the first experiment and practice of trilateral cooperation, advance cooperation in such areas as nuclear power, finance and innovation, and expand cooperation in new industries and new business forms including artificial intelligence, green energy, and digital economy. Wang Yi said that China has successfully explored a path of socialism with Chinese characteristics, which not only conforms to China's national conditions, but also complies with the trend of the times and receives extensive advocacy and support from the Chinese people. China will continue to adhere to peaceful development, and uphold mutual benefit and win-win results. China and the UK should regard each other's development as opportunities rather than threats. Against the current circumstances, China and the UK, as permanent members of the United Nations Security Council, should shoulder due responsibilities and obligations to unequivocally safeguard the multilateralism process, maintain global free trade system and rules of the World Trade Organization, and oppose unilateralism and trade protectionism. The two sides should promote the political settlement of international and regional hotspot issues, jointly advance the common prosperity on the Eurasia continent, improve the reform of global governance system, and propel the building of a new type of international relations and a community with a shared future for mankind. Jeremy Hunt expressed that China is the first country he visited out of Europe. The UK-China relations have enjoyed a sound development momentum in recent years, with constant development of bilateral trade, investment and people-to-people and cultural exchanges. The UK side admires the Chinese government's great achievements in such areas as poverty reduction, and economic and social rights. The UK side believes that China will hopefully become the world's largest economy in the next 20 years, and development and growth of China present opportunities rather than threats to the world. The UK side hopes to, together with the Chinese side, enhance strategic dialogue, and deepen understanding and friendship as well as cement exchanges and cooperation in various fields, in a bid to promote the "Golden Era" of UK-China relations for sustained development. The UK side stands ready to work with the Chinese side to strengthen communication, jointly tackle various challenges and safeguard multilateralism and international order.